OK! At long last, the product test and giveaway from the Beads Direct UK! This was a very cool collaboration because the company is based in the United Kingdom, and I'm in the US. Area doesn't matter when it comes to beads (or friends!). Beads Direct UK sent me a mix of dyed wood beads, magnetic clasps, and braided leather. They also sent some very cool large-hole wood beads with metal cores. I decided to make a couple of pieces of jewelry and then gift a big bag of their beads to you! So stick around a few minutes and learn how to win! The first thing I honed in on was, of course, the hot pink wood beads. Obviously, I love pink. I also had a short length of sari ribbon (or SOME sort of fabric ribbon) and I don't know much about sari ribbon design at ALL. This seemed as good a time as any to try it! First, I strung the wood beads (love that they're lightweight, and evenly dyed!) on a 16ga bronze wire. The gauge gave me the freedom that memory wire doesn't give me -- the ability to "moosh" the bracelet to fit my wrist but not cling to it. Then I tied on the sari ribbon and added a killer clasp. Then end of the ribbon acts as a "dangle", if you will. It's very simple, very lightweight, and I hope it finds a wonderful home. 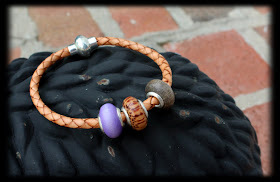 Then I tackled the braided leather, a magnetic clasp, and the large-hole wood beads. I love movement in bracelets, probably why I make so many charm bracelets, so the interplay of the moving beads really makes me happy. I glued the ends into the clasp and BAM, done. Who could ask for easier, and styles like this are really popular right now. Overall, I was quite pleased with the products, and I'd like to pass these along and see what you make and see what you think! So the only rule to this giveaway is you make something and review it, linking to http://www.beadsdirect.co.uk -- and yes, it's open to international designers! 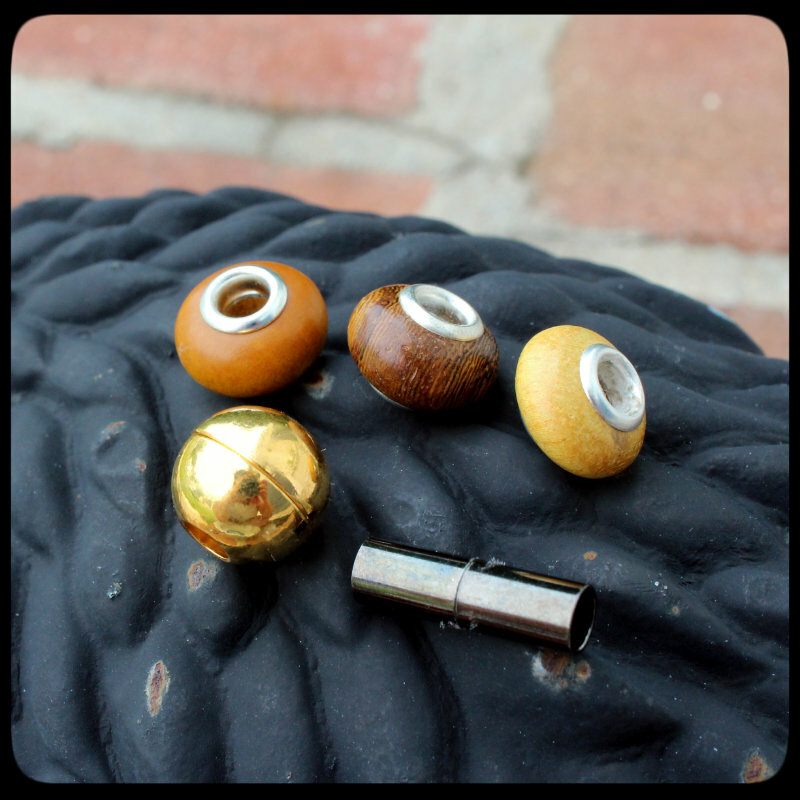 Three large-hole wood beads and two magnetic clasps. Lots of teal braided leather and dyed wood of various colors and sizes. I will announce the winner on Monday! So make a comment (be sure you can commit to making something and doing a review). Extra points for Facebook, Twitter, and blog posts! Thank you to Beads Direct UK for the opportunity! Legalese: These beads were given to me free of charge for my honest opinion. I was not compensated in any way for this review. Ooohhh! I definitely want to be in on this one!! Thank you for your giveaway. I can commit definitely to making something and doing a review if I am lucky enough to win. awesome giveaway! I would love to make something with these and share it on my blog. I would love to be in on this!!!! I will facebook and Twitter!!!! Oh wow! This would be so wonderful to win! I am always looking for things to blog about :) I can commit!! Oooh, I love those pink beads and the leather. That first bracelet is a killer. I'd love a chance to win these and do a review. I would love to do this! It would be a lot of fun and of course I'd blog about it afterwords! Fun, fun, fun! You did a beautiful job Lori. I'd love to enter to win your giveaway, commit to making some pretties and reviewing it on my blog and website. Links are below and I'll go post about it on facebook, right now! Just tweeted about the giveaway and review. 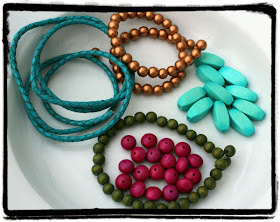 would love a chance to try out the braided leather and wooden beads!I love the teal leather! you are so generous! thank you and hope I win! How can I not want in on this?? I would love the opportunity and chance to grow some more and give an honest review of the materials worked with - bonus I get to make more jewelry! I will gladly share process in my blog and through fb sites. I am posting tonight about this wonderful opportunity! i love what you made with these products! would love to try those out!!! Oh yes! That leather is soo cool! Toss me in for the giveaway! I absolutely LOVE the teal braided leather! Count me in! Oh I would love to give this a try. How could I not with all of my favorite things in one grab bag. I would be happy to post my designs and review on my blog. Those colors! Yummy! Count me in! Isn't sari fun?! Love fibers! What a way to play it forward! I just posted about this on my blog, Lamplightcrafts. I also posted on my FB page! Add me please!! I will FB it and blog about it tomorrow.. <3 Hugs!! I haven't worked with that type of leather cord before. It would be interesting!! Would love to blog about the experience! I hope this isn't a repeat. I would love to work with and blog about it. Looks like fun - and great products. I love the braided leather. Please count me in. Thank you for being so generous in having this giveaway. I would love to win this set of beads and will commit to making something and posting a review. Me me meee...memememe... Mee MEEE-ee (add some music to that)...me please! It would please me! lol Those clasps and that cord would be so neat to try. They look hip. Am FB'ing it right now! tweet it and of course anything else required. Please add my name to the list Lori - wold love to play with these goodies! Please and my name to the list Lori! These goodies look like lots of fun! Pretty cool bracelets Lori! I'd love to win (pick me pick me!)! I'd love to win this and be able to do my first ever review! I'll FB this and tweet (as Mixed Media Jewel) now! Blogging tomorrow when I get back toy computer. Tweeted and FBooked. Will have to blog this tomorrow when I get back to my computer. If I win this would be my first review ever! I would love to do this! I love the colours especially from the braided leather. Thanks for the chance to win. I would love to work with those beads. 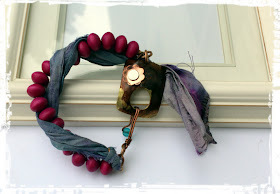 I absolutely love the bracelets you created, especially the one with silk ribbon. The ribbon dangle is a really nice touch! Love your creations! I would love the opportunity to work with the leather and beads. Thanks! Would love the opportunity to work with these items. I hav a l lot of large holed beads so would be nice to see what I c could produce with the items you list. thanks for the opp. And now I've blogged about it! Just tweeted about these great beads and the giveaway again. I love those dark red/burgundy beads. Have blog...will enter! Count me in! You'll be sent into cyberspace via blog and Facebook asap! Interesting,Dahhhling, verry interesting. I would love to give it a try. Very interesting...I'd like to play. Expect a blog post also. I've perused their site but not yet ordered from Beads Direct UK. Would be "chuffed" to receive these (love that verb LOL). Thanks Lori for this oppportunity! Very nice bracelets! I love the colours in the last pic. It's a long time since I did any jewellery with wooden materials (and a long time since I last shopped at Beads Direct) so I'd love a chance to win this giveaway. Thanks for the opportunity! Oh my, these would look great with some polymer clay beads mixed in...the colors are just fantastic! How fun Lori, I would love to participate in this review. I am slowly making my way back to blogging and all after starting a new job. Hey and by the way did the Bead Soup Book scheduled for 2012 come out yet? I have been out of touch. Oh, I'd love to win this, Lori! It may be just the spark I need to get me going again! Plus it's new and different materials to work with which would be great! Thanks for hosting this drawing! Would love to play around with that leather and all those other lovely beads... love some of those colours! COunt me in! Count me in. I would love to work with all those beads and stuff! Thanks so much! I would love to win these. I would love to make something with these!! Thanks so much for generous giveaway!! Will share on facebook. Beautiful wood beads and lovely teal leather - count me in!! I would love the chance to make and review!! Thanks for the chance! Thanx for the chance to win these wonderful beads. I posted your giveaway on my blog & tweeted about it too. Wow - love what you did with those incredible cool red beads. That is a a totally cool look!